We welcome our newly appointed World Climate Ambassador, Dr. Chang Kwon (Benjamin) Chung who is also the President of the System Leadership Institute in Seoul, South Korea. 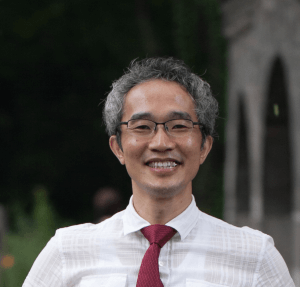 Dr. Chung has worked effortlessly to integrate the World Climate Simulation into the teaching of environmental studies in K-12 education and reach out to Korean government agencies. Dr. Chung has successfully targeted different types of education platforms for World Climate events. In January 2017, he organized a special World Climate simulation event at the 19th Math Festival in South Korea. This is the most famous and largest conference for K-12 mathematics teachers hosted by the Korean Society of Teachers of Mathematics. In May 2017, he ran World Climate with graduate students at the Graduate School of Science and Technology Policy, at KAIST, the Korea Advanced Institute of Science and Technology in Daejeon, South Korea. He has been invited to facilitate simulations in other education settings such as the Gifted Education program of Seoul National University High School for selected prodigies in mathematics, science, literature, social science filed. He designed World Climate as a foundation lesson for 1st and 2nd grade undergraduate students of Department of Energy & Environmental Engineering, Shinhan University, in Gyeonggi-do, Korea. In addition, Dr. Chung has designed a K-12 lecture program focused on system dynamics and systems thinking. The program has seven workshops of three hours each. Usually called Wednesday Class, the first class is dedicated to World Climate. Besides educational institutions, Dr. Chung has held World Climate events with county government officials, targeting specifically those public officials in environment-related jobs. By playing World Climate at the City Hall of Seoul, he hoped that World Climate would permeate the Seoul Metropolitan government. He was able to bring together participants who comprised practitioners of environmental education sponsored by Seoul Metropolitan Government. No one else has been as bold as Dr. Chung in pushing for the integration of environment into the K-12 education in South Korea. 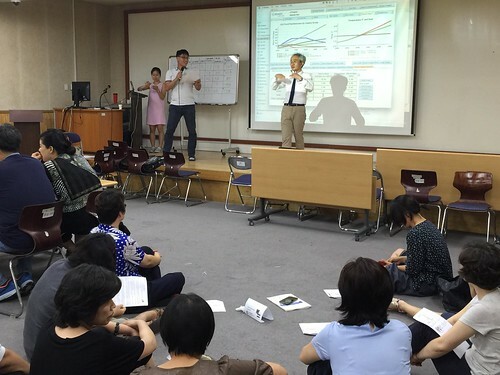 Last month, Dr. Chung introduced World Climate at the Seoul Education Training Institute for the first time. This is the official training centre for K-12 teachers under the Seoul Metropolitan Office of Education. From Seoul Education Training Institute, K-12 teachers earn credits to get promoted. Their participation in World Climate is thus equipping them with climate change knowledge which essentially will be passed on to students. Dr. Chung is already being recognized for his efforts at the national level. He is in dialogue with the Korean Foundation for the Advancement of Science & Creativity (KOFAC), the most influential institute with whom he hopes to run a World Climate event with 120 students who will be selected by their school principals across the nation. He is also planning to run events with middle school students. To aid his efforts, he is developing a World Climate game kit to fit large audiences. Join us in welcoming Dr. Chung to the family of World Climate Ambassadors!